165 PRINT "HI, I AM HELEN." 167 PRINT "TELL ME YOUR PROBLEM"
240 PRINT "PLEASE DON'T REPEAT YOURSELF"
"," I'VE "," I'M "," YOU "
2301 DATA " AM "," WAS "," I,MY "," YOU'VE "," YOU'RE "," ME "
3013 DATA DOES THAT TROUBLE YOU ? 3014 DATA TELL ME MORE ABOUT SUCH FEELINGS. 3026 DATA HAVE YOU TRIED ? 3032 DATA WE WERE DISCUSSING YOU--NOT ME. 3034 DATA "YOU'RE NOT REALLY TALKING ABOUT ME, ARE YOU ?" 3040 DATA WHY DO YOU ASK ? 3041 DATA DOES THAT QUESTION INTEREST YOU ? 3042 DATA WHAT ANSWER WOULD PLEASE YOU THE MOST ? 3043 DATA WHAT DO YOU THINK ? 3044 DATA ARE SUCH QUESTIONS IN YOUR MIND OFTEN ? 3045 DATA WHAT IS THAT YOU REALLY WANT TO KNOW ? 3046 DATA HAVE YOU ASKED ANYONE ELSE ? 3047 DATA HAVE YOU ASKED SUCH QUESTIONS BEFORE ? 3048 DATA WHAT ELSE COMES TO MIND WHEN YOU ASK THAT ? 3049 DATA NAMES DON'T INTEREST ME. 3050 DATA I DON'T CARE ABOUT NAMES--PLEASE GO ON. 3051 DATA IS THAT THE REAL REASON ? 3052 DATA DON'T ANY OTHER REASONS COME TO MIND ? 3053 DATA DOES THAT REASON EXPLAIN ANYTHING ELSE ? 3054 DATA WHAT OTHER REASONS MIGHT HERE BE ? 3055 DATA PLEASE DON'T APOLOGIZE! 3056 DATA APOLOGIES ARE NOT NECESSARY! 3057 DATA WHAT FEELINGS DO YOU HAVE WHEN YOU APOLOGIZE ? 3058 DATA DON'T BE SO DEFENSIVE! 3059 DATA WHAT DOES THAT DREAM SUGGEST TO YOU ? 3060 DATA DO YOU DREAM OFTEN ? 3061 DATA WHAT PERSONS APPEAR IN YOUR DREAMS ? 3062 DATA ARE YOU DISTURBED BY YOUR DREAMS ? 3063 DATA HOW DO YOU DO...PLEASE STATE YOUR PROBLEM. 3064 DATA YOU DON'T SEEM QUITE CERTAIN. 3065 DATA WHY THE UNCERTAIN TONE ? 3066 DATA CAN'T YOU BE MORE POSITIVE ? 3067 DATA YOU AREN'T SURE ? 3068 DATA DON'T YOU KNOW ? 3070 DATA "DON'T SAY NO;IT'S ALWAYS SO NEGATIVE! 3071 DATA WHY NOT ? 3072 DATA ARE YOU SURE ? 3073 DATA WHY NOT ? 3076 DATA CAN'T YOU THINK OF A SPECIFIC EXAMPLE ? 3078 DATA WHAT ARE YOU THINKING OF ? 3079 DATA REALLY ALWAYS ? 3080 DATA DO YOU REALLY THINK SO ? 3083 DATA IN WHAT WAY ? 3084 DATA WHAT RESEMBLANCE DO YOU SEE ? 3085 DATA WHAT DOES THE SIMILARITY SUGGEST YOU ? 3086 DATA WHAT OTHER CONNECTIONS DO YOU SEE ? 3087 DATA COULD THERE REALLY BE SOME CONNECTIONS ? 3089 DATA YOU SEEM QUITE POSITIVE. 3090 DATA ARE YOU SURE ? 3093 DATA WHY DO YOU BRING UP THE TOPIC OF FRIENDS ? 3094 DATA DO YOUR FRIENDS WORRY YOU ? 3095 DATA DO YOUR FRIENDS PICK ON YOU ? 3096 DATA ARE YOU SURE YOU HAVE ANY FRIENDS ? 3097 DATA DO YOU IMPOSE ON YOUR FRIENDS ? 3098 DATA PERHAPS YOUR LOVE FOR FRIENDS WORRIES   YOU ? 3099 DATA DO COMPUTERS WORRY YOU ? 3100 DATA ARE YOU TALKING ABOUT ME IN PARTICULAR ? 3101 DATA ARE YOU FRIGHTENED BY MACHINES ? 3102 DATA DO YOU MENTION COMPUTERS ? 3103 DATA DO MACHINES HAVE TO DO WITH YOUR PRO-   BLEM ? 3105 DATA WHAT IS IT ABOUT MACHINES THAT WORRIES  YOU ? 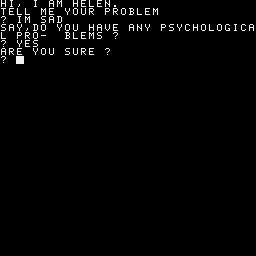 3106 DATA "SAY,DO YOU HAVE ANY PSYCHOLOGICAL PRO-  BLEMS ?" 3107 DATA WHAT DOES THAT SUGGEST TO YOU ? 3109 DATA I'M NOT SURE I UNDERSTAND YOU FULLY. 3110 DATA "COME COME,ELUCIDATE YOUR THOUGHTS!" 3111 DATA CAN YOU ELABORATE ON THAT ? 3112 DATA THAT IS QUITE INTERESTING! 3113 DATA WHY DO YOU HAVE PROBLEMS WITH MONEY ? 3114 DATA DO YOU THINK THAT MONEY IS EVERYTHING ? 3115 DATA ARE YOU SURE THAT MONEY IS THE PROBLEM ? 3116 DATA "I THINK WE WANT TO TALK ABOUT YOU,      NOT ME!" 3117 DATA WHAT'S ABOUT ME ? 3118 DATA WHY DO YOU ALWAYS BRING UP MY NAME ?